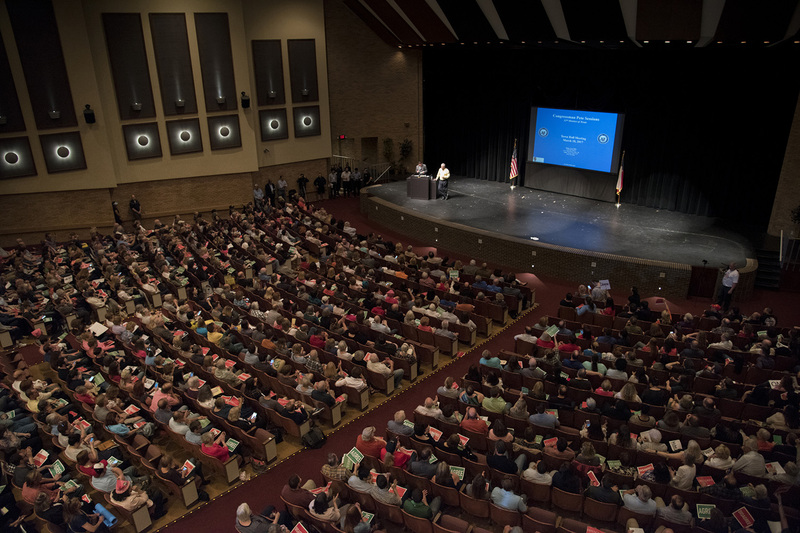 Addressing over 2,000 people, Sessions was frequently drowned out by boos and angry outbursts from the audience. Many of his answers were not entirely audible due to the crowd’s reaction as he began to speak. 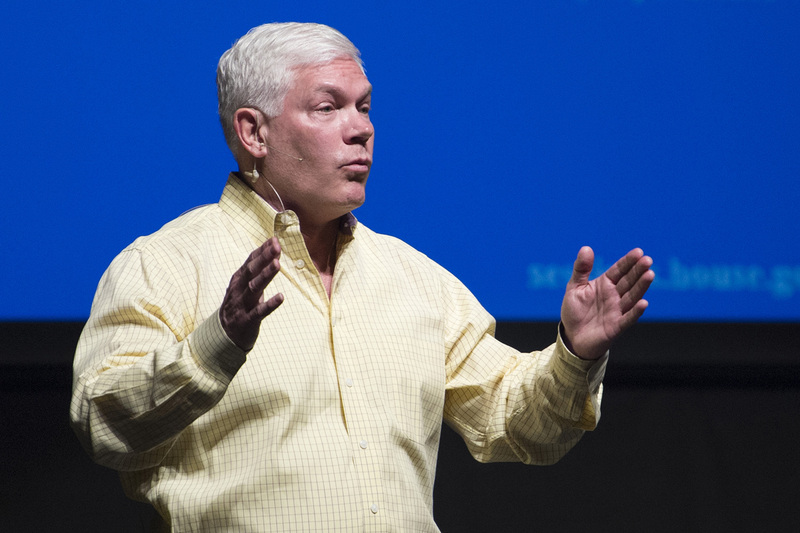 RICHARDSON — U.S. Rep. Pete Sessions, R-Dallas, faced a raucous town hall Saturday as he sought to defend the GOP’s plan to repeal and replace Obamacare, among other issues that have spawned fierce opposition under President Donald Trump. Sessions’ town hall came at a time when members of Congress are experiencing heightened scrutiny over their accessibility to constituents, especially as they prepare to unwind former President Barack Obama’s signature health care law. For Sessions, there are additional political considerations. Democratic nominee Hillary Clinton won his district last year, and Democrats are already gearing up to try to unseat him in 2018. Saturday's event, held at a local high school, took place ahead of what could be the most consequential legislative week of Sessions' tenure as chairman of the U.S. House Rules committee. The panel will take center stage next week as it seeks to advance the Obamacare bill to the House floor. Before taking questions, Sessions attempted to explain the GOP plan with a PowerPoint slideshow. The effort was largely unsuccessful, again due to the crowd reaction. “You know what? I know why you’re so frustrated: You don’t know how to listen,” Sessions said amid the negative feedback, inviting a new round of boos. “I know how to listen,” Sessions added a short time later. Sessions did appear to find some common ground with the otherwise largely hostile crowd. Asked repeatedly about Trump's proposed budget cuts to a number of federal agencies and programs, he expressed support for protecting the National Institutes of Health and Meals on Wheels, the service that provides food to the elderly and relies on grants that could be on the chopping block. Sessions also expressed doubt that Congress would go along with what he described as Trump's "drastic cuts" to the Environmental Protection Agency. Questions otherwise focused on health care and some of the most controversial aspects of the Trump presidency so far. Asked about Trump’s tax returns, which the president has repeatedly declined to release, Sessions echoed Trump’s explanation that the president is being audited by the IRS and cannot yet put them out. Asked about Russian interference in the presidential election, Sessions professed confidence in congressional oversight, pointing out that, for example, lawmakers recently looked into and rejected Trump’s claim that Obama wiretapped his phones at Trump Tower last year. “That is what is called oversight,” Sessions said. The congressman also addressed some Trump proposals that hit closer to home, including the president’s proposed wall along the U.S.-Mexico border. While Sessions defended the wall as a necessary tool to keep the country safe, he did allow that is “unnecessary” along some parts of the border, including at Big Bend National Park. Asked about deportations under Trump, Sessions argued that generally speaking, under current law, "If you do not commit by large a felony or a felony-type offense, you will not be deported.” That drew a reaction from a woman in the front row, Jackie Denning, who stood up and vocally challenged Sessions on the claim. After the town hall, Denning said she had been thinking of an undocumented immigrant in El Paso who was arrested last month by immigration agents after seeking a protective order from domestic violence. Federal officials said the woman had already been deported six times. "I will assure you she is not being deported simply because she was in the wrong place at the wrong time,” Sessions said as Denning confronted him, apparently responding to the El Paso case. After the town hall, Denning was not satisfied with Sessions’ response to her — “He just brushed it off,” she said — but said she “really appreciated that he had a town hall at all." “Neither Cornyn or Cruz has had a town hall, so I’m just glad he had one,” Denning said, referring to Texas’ U.S. senators. "I didn’t agree with what he had to say, but I’m just glad he bothered to have an event at all." 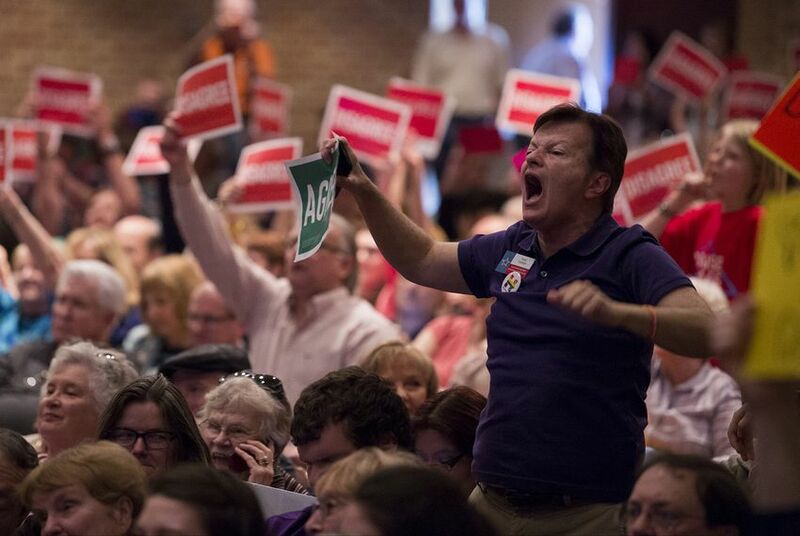 In a congressional town hall in North Texas, U.S. Rep. Michael Burgess, R-Lewisville, withstood two hours of booing from hundreds of angry constituents at a local high school.